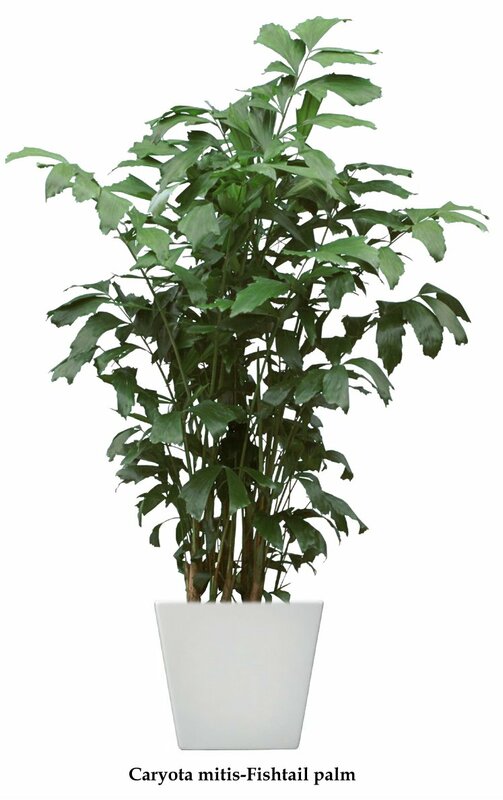 The Fishtail palm is a very unique looking palm with leaves that strongly resemble the fins and tail of a fish. It is not commonly found in interior plantscapes, but can be a great plant for large bright spaces. This palm is native to southeast Asia, China and India. Some species can grow to heights of 25-30 meters! 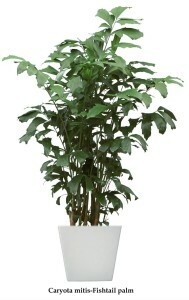 Tropical plant growers will sell these as large potted plants 12-15 ft in height designed for bright atriums. The Fishtail palm is a relatively slow growing palm. It grows in clumps which makes it appear full and leafy. Care of a Fishtail Palm can be tricky. Aside from requiring 8-10 hours per day of good light, it prefers high humidity as well. This is something that is difficult to achieve in a typical office building. Humidity levels are higher when there are many plants in a small area, such as in an atrium. Regular misting can be done in an atrium setting as well. The soil needs to be kept moist at all times as the plant will wilt very quickly if too dry. Well drained porous soil is best. This palm is very susceptible to spider mites. Check the leaves frequently. They will quickly lose their colour when infested with this pest. Regular wiping of the leaves with a wet cloth will help discourage this insect, as will keeping the humidity as high as possible.Fertilize frequently with a good quality tropical plant fertilizer. Because it is a slow growing plant, pruning and repotting is rarely necessary.